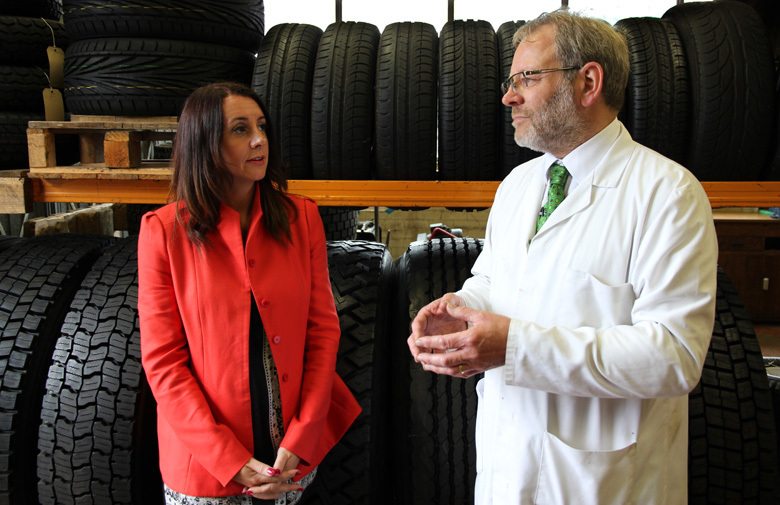 TARRC was delighted to be approached by the prime-time BBC1 topical live magazine programme, The One Show, as independent experts in the field of tyre safety and testing. After identifying TARRC as one of only two independent tyre testing facilities in the UK and speaking to TARRC’s Director of Research and Paul Brown, Head of tyre testing, the producers decided to carry out filming at Brickendonbury as part of their feature on the devastating effects of tyre failure. They chose to highlight this subject after a horrific accident on the A3 in the UK in July 2013, where three people returning from a music festival died in a coach crash after a tyre that was nearly 20 years old blew out. Although it is known that tyres do deteriorate with age, there is no legal requirement to replace old tyres and although the tread might not be worn, serious problems might not be apparent just by visual inspection. Filming took place at TARRC, with presenter Lucy Siegle, in the middle of August and Paul Brown recollects his experience in front of the camera. ‘Being part of a tyre safety article on The One Show was an interesting experience. Just being selected as a laboratory with the expertise necessary was, in itself, a great compliment to Rubber Consultants and TARRC. The show had originally hoped to use a second-hand tyre for the test, but I explained that, unless there was a fault in the tyre they bought, the drum test might not show that the tyre was less safe than a new tyre: the reduced tread depth actually means that such tyres run cooler. The drum test is not predictive of the tyre under extremes of handling. We were very lucky in having a very old, but unused passenger tyre. This tyre was not a premium brand, but was a tyre that we had used in our own research in the 1990s: by no means a budget tyre. Everyone knows that scenes in films & tv shows are shot out of sequence and that a lot of the recorded material never gets aired. Filming here was no exception to this rule. We had great difficulty recording one set of interview because the drains to the compressed air system were continuously clearing themselves of water: two tanks, roughly every 2 minutes, but never synchronised. Being under a flight path also caused delays. These imposed a discipline to the questions and replies they had to be short (never easy for me, made more difficult by the presence of the 2 cameras). Being someone who pre-dates Betamax and VHS recording systems, it was interesting to hear, during lunch, that, despite digital recording and computer based editing prevailing, the language of the industry is still nested in the celluloid and recording tape eras. VT (video tape) is sometimes used in the broadcast program to introduce pre-recorded items is a prime example. I think that the team was a little disappointed in the final outcome of the test. The old tyre did fling several chunks of tread from its shoulders, always an indication of impending of failure, but it exploded with a dull crump and essentially remained intact rather than throwing off the tread and underlying belts like a tyre tested for a client. As was broadcast, we were all huddled in a narrow corridor, with a camera peering in through the armoured window, listening to the tread block pinging across the room. I, personally, was rather glad of the gentle failure as flying belts inevitably mean that the rig suffers damage: usually to its safety devices and the thermocouples around the tyre. The feature on tyres was aired on Tuesday 27th August.